Unhappy with the mechanical switch I had designed for the torpedo motor control, I did a little research and decided to change to a magnetic switch to control the motor. 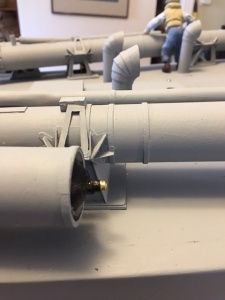 The mechanical switch required a hole in the torpedo wall for the pin to protrude through and I felt that the pin would drag on the wall of the tube during launch and also probably allow water to penetrate the torpedo once it was launched. In these snaps, you can also see the O-Rings used for water seal between pipe and turned wooden components. 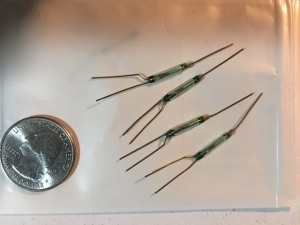 I found some magnetic reed switches that could be wire “always on”, so that I could use a magnet under the front part of the tube to keep the motor switched off until launched. Also, I decided to join and seal the three parts of the torpedos with vinyl electrical tape. I had originally designed them with O-ring seals, as in the photos above, but the tape seemed to work as well or better. And I could use a bit of the same tape to seal the hole in the torpedo wall originally for the mechanical switch and convert the first 4 torpedoes to the magnetic switches. Buoyancy testing was successful, with the torpedo floating slightly nose up just at the surface of the water. Since I hoped to retrieve the torpedoes, I wanted them to float and also leave an obvious wake when running. The drive train worked well and the propeller drove the torpedo through the water at a suitable speed, although the torpedo did rotate, but not severely. The only issue remaining was how long the torpedo would run. 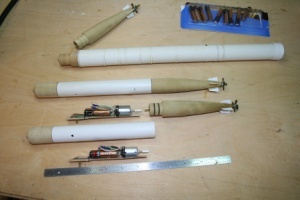 I had built the first torpedoes with the mechanical switches using two AAA batteries for power. I used alkaline batteries rather than rechargeable since I was not sure about retrieval. When I changed to the magnetic switches, I also changed to AAAA batteries. The flotation and propulsion testing was even better with these batteries, but I still had no idea how long they would run. And since I would be running the boat in the rather large Bayou St. John, a long torpedo run might be a problem for retrieval. The solution was to design a tubular slide switch and install it in the nose of the torpedo, where a detonator might be. When the switch is pulled out, it is on, but the torpedo does not run because the magnet under the front of the tube keeps the power off. 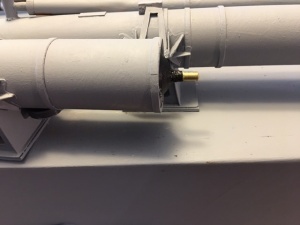 Once the torpedo is launched away from the magnet, the motor runs until the batteries run out or until the torpedo strikes and object head on and the impact pushes the slide switch in, turning off the power. This would mean I would have to be fairly accurate in aiming the torpedoes and solid targets, such as the concrete steps along some of the bayou, or a canoe. This photo shows the slide switch installed in the nose of the torpedo. 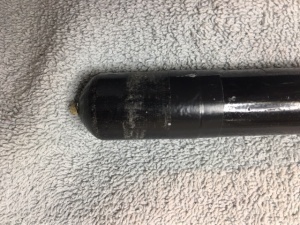 These photos show the torpedo in the tube. On the left, the slide switch is pushed in, turning power off so the torpedo can be slid into the tube and the retaining block engaged with the launching pin. On the right, the slide has been pulled out, “arming” the torpedo to run. The magnet just visible on the underside of the tube in front of the forward pedestal keeps the power switched off until the torpedo is launched, when it should run until it bumps into something and pushes the slide in. All this seemed an elegant solution and worked well in testing. On the second water trial of the boat, in February, I did fire two torpedos, which launched perfectly, but I had forgotten to pull the switches out (on position) so the torpedoes did not run. They went about 5 feet from the boat at the launch and then floated for a bit. The water was just choppy enough that we soon lost sight of them and they probably sank pretty fast. So it goes. No definitive cure for stupidity, but I now have a “pre-flight” check list including arming the torpedoes.